Current management may play only a minor role in the current sink of regions. It is the past that has determined the autonomous dynamics, with possible modification by current management, CO2 fertilization, and other factors. To explicitly address the current effects of past action, the Marrakesh Accords state: "That accounting excludes removals resulting from: (i) elevated carbon dioxide concentrations above their pre-industrial level; (ii) indirect nitrogen deposition; and (iii) the dynamic effects of age structure resulting from activities and practices before the reference year" (UNFCCC 2002) — that is, direct and indirect human induced activities must be separated (Sanz et al., Chapter 24, this volume). Since this separation is extremely difficult, policy makers have a temporary solution for the first commitment period (2008-2012). Specifically, accounting rules or caps limit certain activities or the amount of credit that industrialized countries may obtain from measures involving land use, land cover, and forestry. For subsequent commitment periods, however, direct effects will have to be separated from indirect effects in a more comprehensive way. A possible approach to this is given in Figure 16.5. The basic idea is that the direct impact of a measure slowly fades, relative to CO2 fertilization and N deposition (Figure 16.5). This fading out is given by the curve in the B graph. For each management measure, the shape and angle of the transition from direct to indirect effects would have to be assessed. In case of organic matter addition to cropland, for example, most of the direct effect is gone after two to three years. With afforestation, the direct impact may be large for decades. This approach becomes complicated, however, when extended to every management and every region. Tackling this question raises large scientific challenges. Possibly, significant contributions can be made by combining age class distribution models with terrestrial ecosystem models. 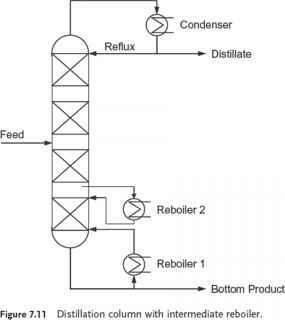 Figure 16.5. A possible approach for separating direct and indirect effects. 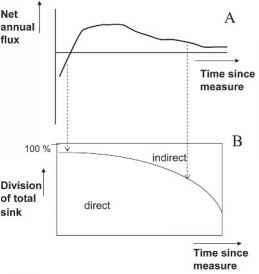 A management measure is carried out at year 0 and has a sink impact as given in the top graph A, comparable to the trends given in Figure 16.3. The B graph then proposes how the sink in time can be assigned to direct impact of the human-induced measure versus the indirect impacts. It is likely that the direct impact declines through time, as the relative impact of weather variability, CO2 fertilization, and N deposition increase.